Who? or what, is the newest, most breath-taking, most sensational super-hero of all...? 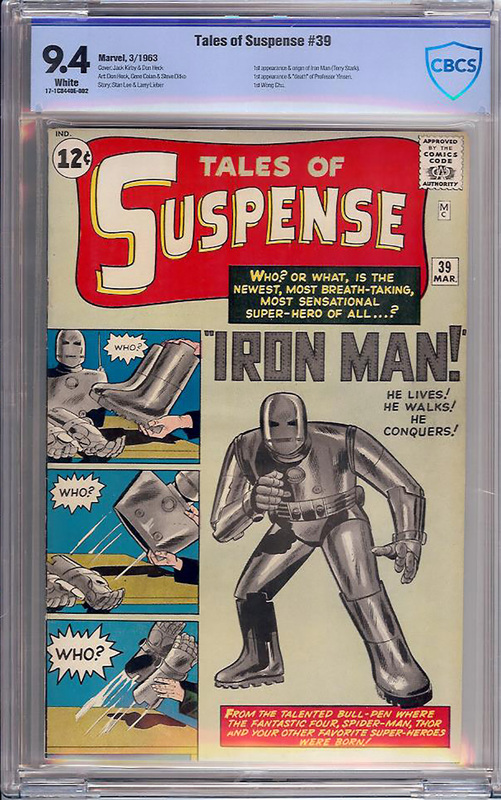 That was the question that readers were asked when they plunked down their dimes and bought this issue featuring the first-ever appearance and origin of Iron Man. One of the more popular Marvel keys and eye-catching Kirby covers, this book came out the same month as Amazing Spider-Man No. 1 and is an absolute classic. The copy offered here is a solid CBCS Near Mint, with perfect registration, a sparkling spine, radiant cover inks, fresh and quite outstanding MILK WHITE pages and incredibly sharp and straight edges. Features the origin and introduction of Iron Man by Stan Lee and Larry Leiber with art chores ably handles by Don Heck, Gene Colan and Steve Ditko. The cover was drawn by Jack Kirby and Mr. Heck. The registration and centering really stick out on this book. Take a look and you'll see what we mean.